Punk Rock Parents: American Girl Madness!! While at The Grove we stopped in at the American Girl Place. Now the only experience I have had with these doll is that my niece has one. The Phi has never ever expressed any interest in one of these dolls. Remember that fact. 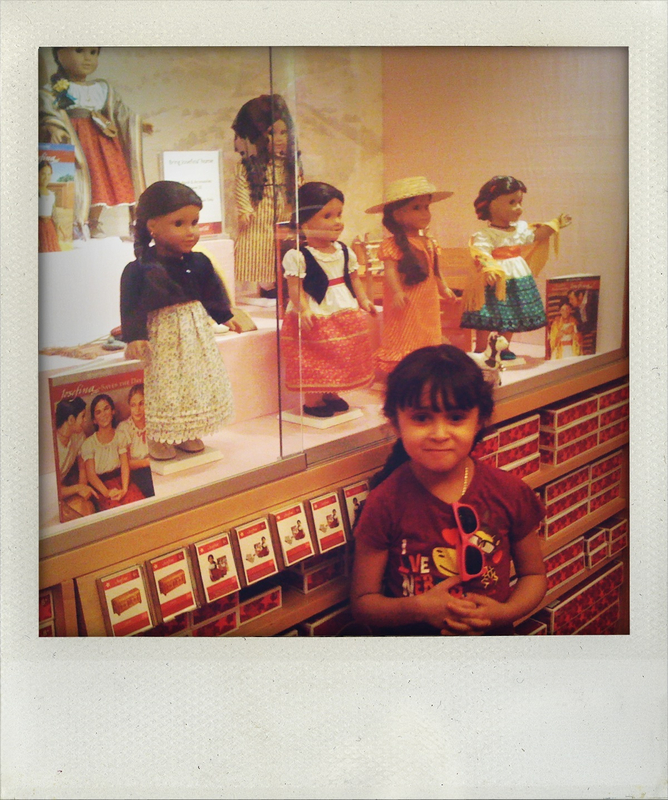 It will be important later in explaining the power of American Girl. So first off this place is 2 stories. We entered into the first floor to find a book store area and another section filled with dolls all wearing the exact same purple outfit but with every combination of hair color, texture, skin color and eye color. After looking around The Phi found that doll #34 was her exact match. Light skin, brown eyes, auburn hair with bangs. We had been in the store a total of 10 minutes. Had only seen 2 sections of the place and already The Phi HAD TO HAVE ONE. As we made our way to the back section of the place there was a beauty salon where for $20 you can pick and the hair style you want. There is a salon chair, stylists, and cloth drapes FOR THE DOLLS. I can't stress this enough. There was a salon where people paid money for their kids dolls to get their hair done. Also on the first floor, a doll hospital. Where if your doll gets broken you can bring her to the hospital where she will get a special hospital gown and for what I am sure is a high price tag will be returned to you good as new. With our jaws on the floor we made our way up to the second floor. There we saw the "personal shopper" room. 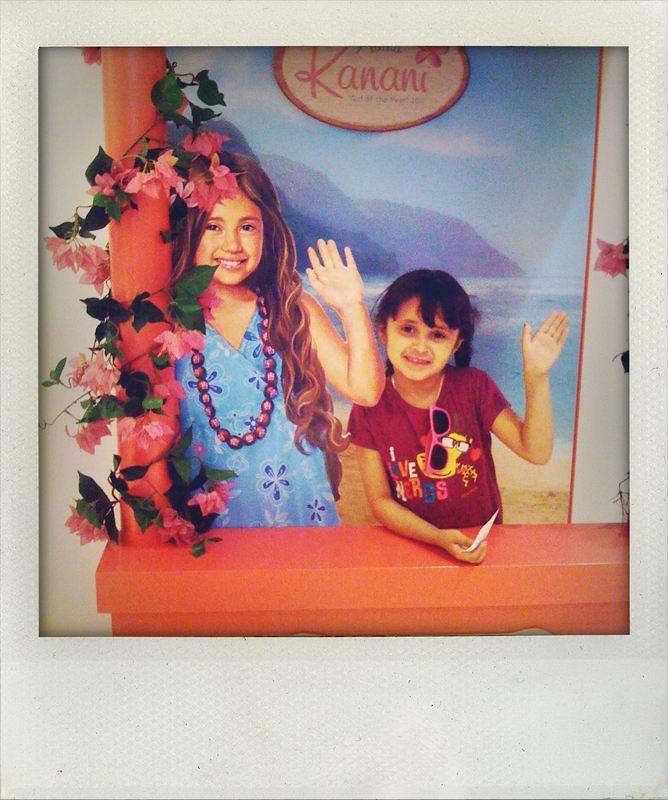 Filled with private rooms where American Girl staff will help you pick the perfect doll and clothes. Then we moved into the itty-bitty baby section. Not only where there dolls, there were also baby dolls. And to justify the $100+ price tag they came as twins. And if that wasn't enough you can also purchase a double stroller for your twin babies. We turned a corner to find another room filled with the exact dolls from downstairs but with more clothes options everywhere. From what I could tell an outfit will run you about $30 and they had everything from a horse riding outfit to a hula skirt. After another corner there was a hall of historical dolls. Here were small rooms and each room had a doll from an historical period of time from the Great Depression to the 1970's. Each doll had a book series and many many accessories from bicycles to a toboggan. The Phi in the Josefina room. A young girl from New Mexico. Hey at least they had a Mexican one! 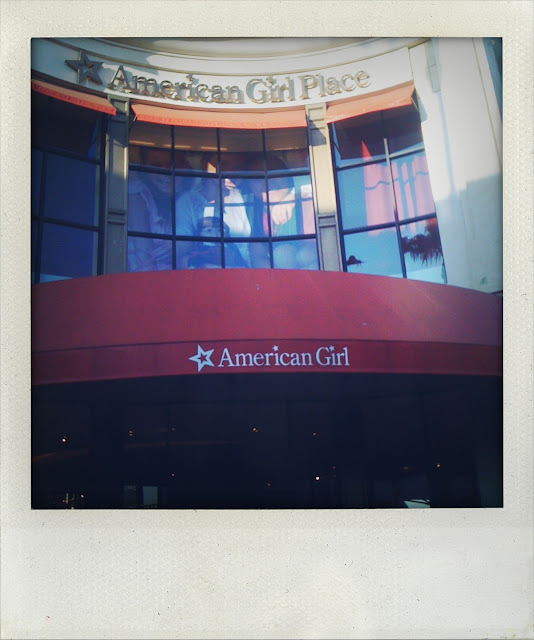 Also on the second floor was the American Girl Cafe. Yes a full on fancy schmancy cafe where there are special seats for your doll to sit at the table with you. As we walked around The Phi kept asking us, "Can I get the doll Mom?" after I told her no repeatedly she went to her yes man, Dad. He explained to her that, no we were not going to get a doll that day. That they were expensive and we did not plan on buying anything that expensive that day. We could take home a brochure. In an instant her whole body changed. The disappointment in her was so big her whole body drooped. I really thought we were going to leave there with The Phi in tears. Which never happens but I have never seen such disappointment in that kid. Now here is where I remind you that not 30 minutes earlier she had never heard of or showed any interest in these dolls. A short stroll through the American Girl Place and now there was nothing else in the world that she wanted more. Now that people is good marketing. For christmas one year, my brothers and I all pitched in to buy the Josefina doll for my grandma Josie, who collects dolls. We even bought one extra outfit. But, mind you, the cost was divided by FIVE ADULTS! Poor phi. I see the same look of disappointment in my kids every time we visit the Lego store.